An armed gang is being sought after a bank official and his family were held hostage at their Co Kildare home overnight. It is thought up to €7m was stolen when the official was forced to go to the Bank of Ireland on College Green in Dublin and withdraw the cash. The gang forced their way into the home of bank employee Shane Travers in Kilteel last night and took the worker's partner, Stephanie Smith, her mother, Joan Smith and Joan's five-year-old grandson hostage. Ms Smith was beaten before the family was taken away in the family car. Shane Travers, who is in his 20s, was then forced to drive his car to the bank. After withdrawing the money, he handed it over to the gang at Clontarf DART station. His family was then released in the Ashbourne area, Co Meath. 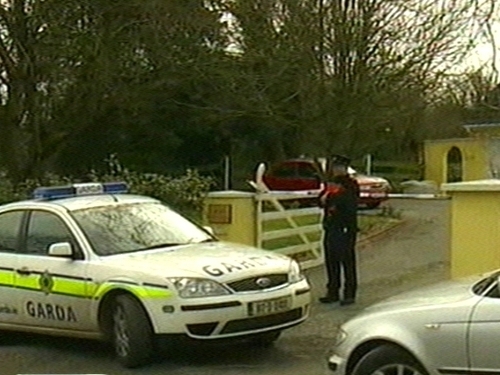 The red Toyota Celica was later found burned out in an apartment block near Tolka House Pub, Glasnevin. Gardaí are now appealing for information on the movements of the cars used in the incident - the bank official's red Toyota Celica (99-D-88856) and the family's dark Volkswagen Golf (05-D-33720). The men involved are described as being very tall and one is of particularly strong build and may be a bodybuilder. Anyone who saw anything suspicious in the Rathcoole/Kilteel areas at around 5.30am this morning, or in the Clontarf or Ashbourne areas after 7am, are asked to contact gardaí on 045 884389. No shots were fired during the incident but the family is said to be extremely traumatised. Minister for Justice Dermot Ahern has said proper procedures were not followed during the raid this morning. Mr Ahern expressed his shock that such a heist could result from one man being targeted. The Minister confirmed this afternoon that gardaí were not contacted until the money had left bank premises, which is said is not in compliance with proper procedures. Mr Ahern said several issues of concern have been raised and discussions between the bank authorities and gardaí would take place. He said he was concerned about the way the matter was handled, and that the main focus now is to investigate the matter. Although he did not confirm the amount stolen, he said media reports are not far off the mark. Mr Ahern confirmed that the CEO of the Bank of Ireland has emailed all staff following the robbery reminding them of the procedures which should be followed when such events occurred. He said it is easy for people to say that things should have been done better, however he said an enormous amount of pressure comes on staff when such events occur. The Minister said he is in no way critical of the people involved but he said the banks must ensure that any gaps exposed as a result of the robbery are closed and closed quickly. New Bank of Ireland Chief Executive Richie Boucher sent an email to all staff this afternoon to remind them of the bank's security procedures. He said: 'Our priority is always for the safety and well-being of all staff. I am sure this incident will raise concerns. Our best defence is to follow tried and tested procedures.